I have been active ever since I can remember. As a kid, I was riding bikes, running through the woods, or playing ball with the neighborhood kids. Throughout my school years I played intramurals and sports as often as I could, which led me in the direction of pursuing a Bachelor of Science in Human Kinetics with a minor in Health Sciences from St. Francis Xavier University. I also graduated as a Certified Personal Trainer through the Canadian Society for Exercise Physiologists, which I still maintain, as well as through the Certified Professional Trainers Network. Most recently I have become a C.H.E.K. Exercise Coach through the C.H.E.K Institute and am recognized as a Level 1 EIMC (Exercise is Medicine Canada) Exercise Professional. I am also a certified Personal Trainer through Can-Fit-Pro, a level 1 Agatsu Certified Kettlebell Instructor, and am certified on TRX suspension training. Throughout my years as an athlete, especially while playing tackle football for seven years, I have had numerous injuries, including a few major ones to my back. I firmly believe regular chiropractic care, massage therapy, and changing my workout routines to fix my posture, muscular imbalances, and by improving my core strength, has decreased my back pain immensely and prevented many other injuries. Since graduating from University, I have worked in a number of gyms, working my way up the ranks, and learning more and more every day. While working as a full-time Personal Trainer for seven years with GoodLife, I attended numerous courses and conferences to further my knowledge. I was presented with a number of awards, including Trainer of the Year in Nova Scotia, and was selected as one of the top 500 Employees in the company across the country four years in a row. Helping my clients change their lives for the better through a holistic approach is very rewarding. Whether it be improving their strength and conditioning, mobility and posture, coaching them on healthy eating and healthy living, or helping them to move better and live pain free, has been so rewarding. 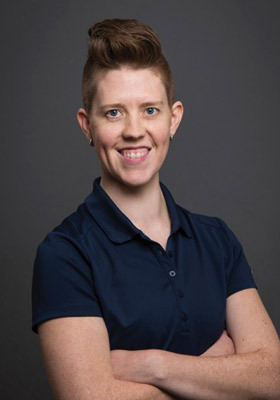 I am passionate about helping people with my holistic approach to health and fitness and am very excited to be a part of the great team here at Clayton Park Chiropractic Centre! I look forward to meeting you!